GiveJet has stayed in business for a number of years by beating out competition in both local and international markets. With thousands of flights under their belt, the operations team at GiveJet has taken their skill-set, brought on technology specialists, and turned the private aviation field on its head! Founded in 2005, GiveJet is a part of a global aviation initiative that is designed around making private aviation grow into new markets. Part of the National Business Aviation Association since 2010, GiveJet has completed a wide variety of private aviation flights. Nearly every major airport both domestic and international has been a part of our nearly 5,000 flight operations. Our history of excellence is not only our past but is also guiding us into the future. With every take off and landing, we are proudly continuing our goal of private aviation perfection. GiveJet seeks to make private aviation more accessible, more convenient, and better targeted for your needs. This mission is achieved through priority attention to our clients, going above and beyond to find the perfect aircraft or jet for your needs, and by making our team fully available to you. Our responsibility is to provide safe, efficient aircraft options for every flight. Maximizing client protections, obtaining safety records as needed, and staying up to date on the safety status of the nation's fractional fleet are all parts of our promise to you. Who is behind the GiveJet team? The GiveJet team comprises of a wide variety of experts inside of the aviation field. This professional staff includes former mechanics, former pilots, teams of experienced charter agents, and technology specialists who are all working to provide you the best possible flight options. The GiveJet advantage built around using technology to help us get better prices, on more aircraft, than our competitors. Where other private aviation teams rely on old books of business, antiquated connections, and dying forms of communication to get their quotes, GiveJet is tackling the private aviation industry with the mindset of a 21st century business. 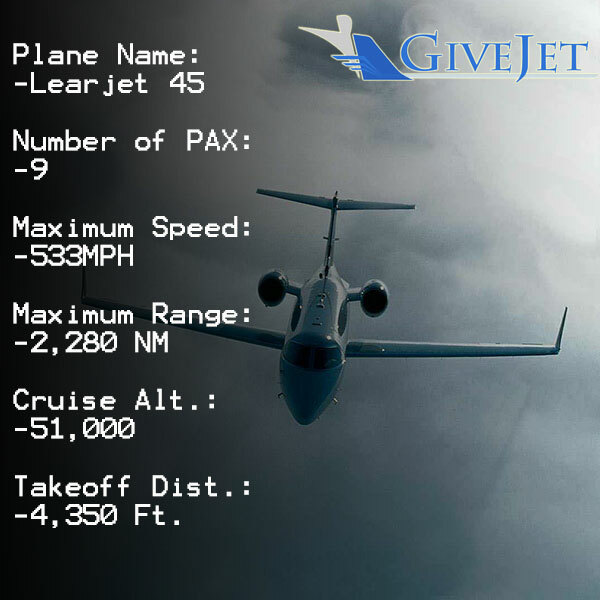 Aircraft tracking software, available aircraft analytics, and calendar syncing with nearly every jet in the US allows for GiveJet to find you the best possible aircraft faster than ever. Why does GiveJet do all of this extra work? It is because the flight team is not satisfied with only getting you a “good” price, we want to find you the very best quote. Our team believes that by finding you the very best flight option, we are effectively encouraging you to fly more frequently by providing more amenities at better value. The second branch to the “GiveJet Advantage” is in our Sky Routes and Rewards programs. This is built around the premise that the more often you fly, the more value you get out of each flight. This splits into two categories. Extremely frequent fliers, over 25 hours a year, can be automatically enrolled into our Sky Routes program which locks in extremely attractive prices on their most common flight routes. Jet Card holders who embrace the Sky Routes program are able to receive up to 20% discounts on many of their trips. For less frequent flyer, after a single trip, our advanced tracking system will begin categorizing and documenting all of the rewards that you have accumulated. Even if you fly but a few times a year, valuable rewards such as free flights will begin to accrue in your account. What is "No Commitment Jet Charter © "? The private jet charter community has been historically exclusive. If wanting to fly, one had to be ready to face large fees and extreme conditions. This is no longer true thanks to our "No Commitment" program. You only pay for the flight and no excess deposit is required. For even better accessibility and security, you can pay by American Express. A private flight is significantly safer than any ground based alternative. For even better safety, GiveJet uses operators that have passed our Safety Matrix © program. By looking through the history of each operator and the maintenance of their aircraft, we can be certain that each flight has maximized safety. I plan to fly frequently, do you have a discount program? Our URL is jetcharterrewards.com for a reason! We offer 5 free bonus hours with the purchase of a qualifying 25 Hour Jet Card plan. This is a $49,000 reward for flying on our Sky Routes card. Good luck finding a better reward program than this! You can contact us through the book now button at the top of the page or the flight booking program at the bottom! Feel free to call our office at + 888-544-8353 at any time. GiveJet offers some of the best prices on the market for the flights that you need. Our pricing is based on the principle that those who fly common routes should not subsidize those who fly odd or "out of the way" routes. This means that for 95% of flyer, GiveJet offers unbeatable rates. By focusing on these common routes, we are also utilizing the nation's fractional fleet which means you are flying on top of the line aircraft. The combination is better rates and better flight options. This is why we say, "Fly Better, Fly GiveJet".